a week work of riding and painting. 2002 Fall – Attended Artist Magazine’s Ultimate Artists Conference, Palm Springs, California. 2002 July – Attended Robert Burridge outdoor workshop. 2002 May – Attended Oil Painting workshop with Ken Christensen, sponsored by the San Luis Obispo Art Center. 2002 January – Attended the American Society of Portrait Artists’ ‘The Art and Practice of Portrait Painting’, a 3-day conference and demonstration featuring Michael Del Priore, Sherry McGraw and Craig Nelson. Academy of Art, San Francisco, California. students with their preliminary drawings and sketches for oil paintings. 2000 February – Attended weeklong workshop with M. Douglas Walton in Cayucos, California. Learned various wet-into-wet techniques for use with acrylic, latex and watercolor..
Chapter of the Sierra Club, 2001. 2001 July, Exult with Me, published book of my mother’s pen and ink drawings accompanied by her brother’s poetry: Kelvin Ray and Margaret Foster. Barbara Museum of Natural History. 2001 Artist-Creating color cover illustration for the book: The Path of Return, by Jaya Sarada (Grace Foundation Publishing, 1998). 1999 Fine Art Illustration-Full-color back cover art for Purebred Lab Breeder’s Magazine. 1998 & 1999 Graphic Artist, Illustrator-Created invitations for Wild Horses Benefit Equine Art Show. Proceeds benefit Foundation for Horse and Other Animals (FHOA). 1998 Package Design–Hot Chile Chocolate for Hermann’s Chocolate Lab, Templeton, California, with David Butz’s computer assistance. 1998 Illustrator– Created illustrations for the book: Trust in Yourself, by Jaya Sarada (Grace Foundation Publishing, 1998). 1997-1998 Fine Art Illustrations-Proposal renderings for renovation project, Santa Barbara Historical Society Museum. 1997 Illustrator– Created illustration for Santa Barbara Land Trust (in conjunction with UCSB) to be used on invitations to Oak Group and Guests art exhibition to benefit Sedgwick Ranch Acquisition. 1994 – 1997 Graphic Artist–Cambria Directory and Castle Country, published by The Cambrian newspaper. Painted color cover for Castle Country in 1996. 1994 & 1995 Illustrator-Painted color covers for North County Access, North San Luis Obispo County California, telephone directories. 1994 Fine Art Illustration-Created pencil drawings for the book: RANCHOS, published by Ellen Easton, Ellen Easton Gallery, 1996. 1993 -1994 Illustrator-The Nature Conservancy Carrizo Plain Visitor Center, Carrizo Plain, California. Created illustrations for permanent display depiction wildlife and Ecosystems for visitor education. 1992 – 1993 Illustrator-State Parks and Recreation Fund. Commission administered by the City of Lompoc, California. Designed signs for new State Park site. Created a painting for Lompoc City Hall, to be reproduced as educational material in traveling display for public school system, and as part of Museum of Lompoc diorama. Sales of posters benefitted the museum. 1986 – 1987 Illustrator-Front cover art, Leisure Magazine, published by the Country News, Paso Robles, California. 1985 Fine Art Illustration–Bird List, Santa Barbara Botanic Gardens. 1984 – 1985 Illustrator-Created illustrations for the book: Birdwatching, a Guide for Beginners, by Joan Easton Lentz and Judith Young (Capra Press, Santa Barbara, 1985). 1983 – 1985 Technical Artist-Delco Electronics, Goleta, California. 1982 Fine Art Illustration-Brochure for Camp Laurel Springs, Santa Barbara, California. 1981 – 1985 Medical Illustrator-Pudenz-Schulte Medical Research, Goleta, California. Worked with research doctors to illustrate new medical procedures. 1979 Book Design and Production–Haiku, for Capra Press, Santa Barbara. 1979 Aerial Photography and Site Proposal Rendering-For Rancho Oso, Santa Barbara. 1978 Designer– California Decorative Metal, Cedar Glen, California. 1977-1979 Illustrator–The Mountain News, Jean Preston Real Estate, Lake Arrowhead, California. 1977 – 1978 Artist, Illustrator, Ad Sales, Food Columnist, Delivery Person–The Crestline Courier, Crestline, California. 1977 – 1978 Artist– Created pen and ink “House Portraits”, individual private commissions for stationery and greeting cards, Lake Arrowhead, California. 1973 Illustrator-Doctoral Thesis, Space Sciences Lab, Berkeley, California. 1964 Draftsman-Created technical illustrations for a patent attorney, Portland, Oregon. 1964 Commissioned Artist-Painted portraits of polo ponies in Oregon. 1963 to present Illustrator-Freelance work has included drafting, medicine, architecture, natural history, real estate, equestrian, portraiture, and archaeology. 1988 October issue, American Artist Magazine, “Painters as Preservationists”, p. 72-77.
celebration of the preservation of 2500 acres of the dunes. 1994 November issue, Sunset Magazine, Article about the Oak Group, p. 92-95.
description of the unique equipment she takes when painting on location. Center for OPAG (Oil, Pastel, Acrylic Group) inspired by workshop taken in February. Winter 2001 Featured Artist, The Plein Air Scene Newsletter. Spring 2002 Featured Artist, www.thepleinairscene.com Directory. 1986 to present Member, The Oak Group. 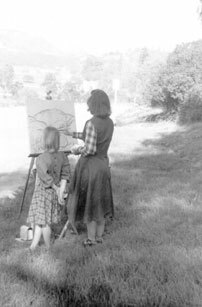 1993 to 1995 Founding member, San Luis Outdoor Painters Enterprise (SLOPE). 1995 to present Member, California Art Club. 2001 to present Associate member of Women Artists of the West (WAOW). 2003 Member Paso Robles Art Association, Paso Robles California. 2003 San Luis Obispo Art Center, SLO California. 2003 Cayucos Art Association, Cayucos California.